i am out of town on something of a work(ing) holiday, nestled in a quiet old stone house in a small town along the St. Lawrence River, where i will be spending the week studying for my upcoming PhD comprehensive exams. 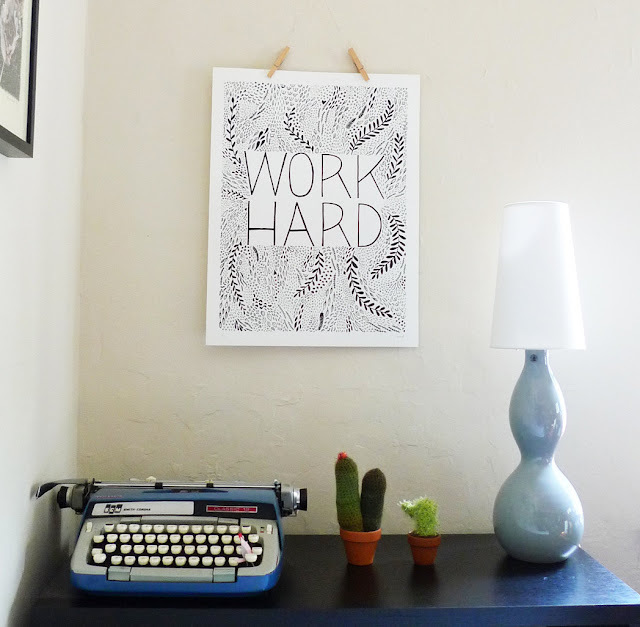 inspired by this lovely silkscreen print by Erin Dollar, which i am posting as both an illustration of the week ahead of me and as an artful reminder of the work i need to accomplish this week, my goal is to remain focused and "work hard." while i am always hard at work, steadily working days & nights and weekends, i am also constantly distracted at home by any number of things: nova lily and other art-making projects, playing house, wedding planning, blogging/reading blogs, snuggling with my kitty.... as September is quickly passing by and deadlines are fast approaching, i need to stay focused on my academic work so that i can get through this phase of my degree, return to my life with andrew, carry on with my research, and devote more time to my art. visit Erin's etsy shop for more artful goods. you can also find Erin on her blog.